Even the screams of the birds cannot hide the flapping sounds of the African sharptooth catfish as the water boils and they chase the small fish along the reed bank. The competition for the abundant little fish is fierce. There are herons and egrets, darters and gulls, and even the occasional fish eagle, all braving the predators from below. Sharptooth catfish (or barbel) grow to 60 pounds and tigerfish to 20 and both prove their gourmand status by gorging on fish and fowl. 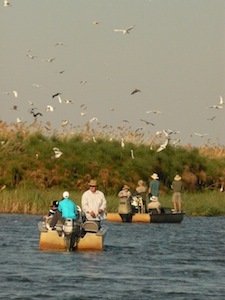 With the boat engine gently keeping pace with the current, flies and lures must land next to the overloaded reeds to have any chance of getting the attention of the hungry predators. A misplaced lure can end up attaching itself to the greenery, or even to one of the birds that is reaching down into the water. When the fly-line is whipped up by the breeze and lands across the lines of the other anglers, there are loud grumbles and curses as the tangles are sorted — less time to get that trophy tiger. The angling is strictly for sport. The catfish harbor a parasitic worm and the tigers are very, very bony. 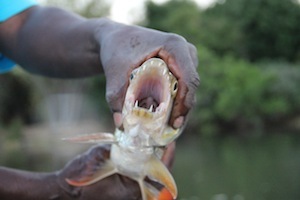 Expect to lose most of the tigerfish, who fight like demons, and the barbel are really big and take a long time to net. 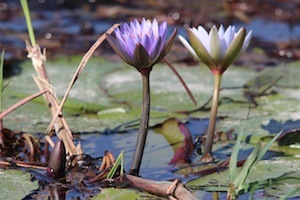 Of course it is not just the fish that attract one to the Okavango. The Delta is a Garden of Eden and abounds with animal species including the big five. The barbel run takes place in October, which is the ideal time to fit in some game viewing. 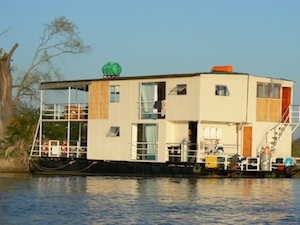 Specialist angling safaris provide fishing gear and guides, or you could elect to take a houseboat to the barbel run and spend some time relaxing in the heat of the day. The Delta Bell is just one of the ideal ways to enjoy the wilderness in comfort. With four large staterooms and ample community space, those visitors who wish to prove their culinary expertise can make use of the fully-fitted galley or give detailed instructions to Mubashi, the chef, who can rustle up a snack or produce a four-course meal. If you are looking for memories, then this is one that you will cherish. Commercial flights can get you to Maun in Botswana, and a charter (or hired vehicle) will take you to any one of the many safari operators in the Delta.